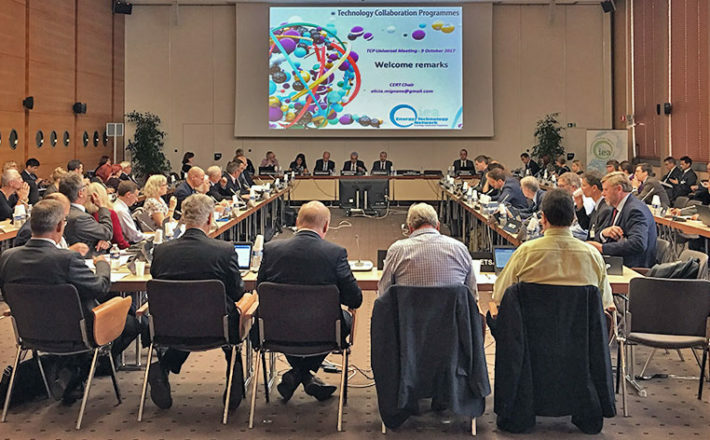 The International Energy Agency held the second universal meeting of its Technology Collaboration Programmes (TCPs) in Paris today (October 9th 2017) to discuss ways to accelerate energy technology innovation. The meeting brought together experts from 31 technology programmes and government officials from IEA member and partner countries. It provided a timely and strategic opportunity to review how TCPs can strengthen the IEA’s efforts as a global hub for energy system transformation and innovation. The event was opened by Dr Fatih Birol, the IEA Executive Director, and Dr Alicia Mignone, Chair of the IEA Committee on Energy Research and Technology (CERT). The 38 IEA TCPs link more than 6,000 academic, government and industry stakeholders from 53 countries worldwide. For over 40 years, TCPs have brought together experts from the public and private sectors to share experiences in fields as diverse as ocean energy, smart grids, carbon capture and storage and hybrid and electric vehicles. Together, they have fostered technological breakthroughs as well as contributing data and expertise to IEA analysis and policy recommendations. Dr Mignone reported on the concerted efforts made by the CERT, its Working Parties, and the Secretariat to strengthen TCPs further since the first universal meeting in 2015. She noted that the network had strengthened and broadened. However, she noted it was crucial that all parties should commit resources adequate to the levels of ambition to ensure the programme’s continued success. The TCP universal meeting included discussions around the current and potential linkages between TCPs and other multilateral efforts, notably under Mission Innovation (MI) and the Clean Energy Ministerial (CEM). Christian Zinglersen, Head of the CEM Secretariat, and Paul Durrant, Head of the MI Secretariat, recognised the strategic interest to advance the global agenda for energy innovation and technology collaboration in a manner that maximises efficiencies and partnerships among multi-lateral efforts.